For most people visiting Australia is a dream, or if they do get to make a trip over it’s a once in a lifetime opportunity! So you can imagine my excitement when we were invited over to attend a family wedding just north of Brisbane. Planning a trip to Australia is costly; flights, accommodation, food & drink, car hire/running costs, spending money, planned trips/excursions – it fairly mounts up. I think we had around 8 months from the point of being invited to the actual wedding day, so it is a lot of money to save up in a short space of time. In this post we will look at travel, I’ll do separate posts on accommodation and my top things to do in Noosa. The first thing we looked at was our flights; we knew the wedding date and how long we wanted spend over there, so we began trawling through thousands of pages of flights to find the right ones. 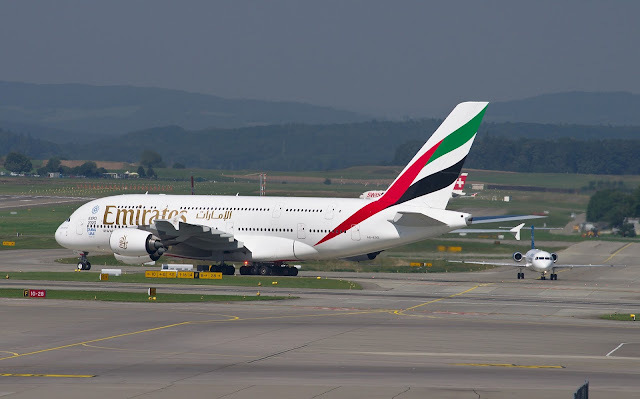 The most popular or most recognised airlines for flights to Australia from the UK are Emirates and Etihad, although we spent weeks searching through numerous others too! Most quotes were upwards of £1000 per person, which just seemed soooo expensive! After weeks (and I mean weeks! Think of the meme with the skeleton sitting at the laptop - that was us!) we saw that Emirates had a 'flash sale' on and we could get pretty good flights from Glasgow for just over £700 each - wow! We'll take 8 of those please! One thing to mention here is that we did also look at fly-drive options, for those of you unsure of what a fly-drive is (no, it's not something you hear about in gangster movies!) it's essentially booking your flights and accommodation together as a package via a travel provider. The good thing about a fly-drive booking is that you don't have the full price of your flights to pay upfront, with most of them you can pay an initial deposit and then pay the rest in monthly instalments - which is a handy option to have when looking at a destination as expensive as Australia. That being said the one downfall we found when looking at fly drive deals was the accommodation; we had a rough idea where we wanted to stay and most of the travel agents didn't have any accommodation in the area we wanted that was big enough for us all (8 people - 6 adults and 2 kids). The flight from Dubai to Brisbane was the Airbus A380, my first time on a 'double decker' plane (anyone else wonder how that thing stays up!! Actually on second thoughts, maybe better not to think about that too much...) This time our seats were in a row of 3, we were hoping that we'd have all three to ourselves however the cancellation of another flight meant there was no way that would happen! We ended up with a man next to us, although he just nodded off for pretty much the majority of the flight so that wasn't so bad. The seats in the row of 3 felt so much more spacious than our previous flight, we were actually pretty comfortable and apart from having to try and stop a fight between my 5 year old nephew and my 3 years old niece - it was a fairly smooth flight. Coming home we were on the 777-300er all the way, so back to the 2 seat configuration, which was more than a little uncomfortable to say the least. Plus, coming home, I always think you are in the mind set of just wanting to be home, which can make your patience wear a little thin at times. The one major gripe I had on our return flights was the layover procedure. We stopped in Singapore for an hour, so realistically, by the time everyone disembarks, it's almost time to take off again! However, Emirates make you check in again at the exact same gate you just came out of! So you can imagine that a 1 hour layover then becomes a delay. I don't understand why, If they really have to have every passenger disembark, they don't keep everyone in a holding area before they then let them board again, surely that would save time? By the time we arrived back in Glasgow we were well and truly past the point of exhaustion! If you are thinking of flying to Australia, I would advise you break the journey up and stay over night in one of your lay over cities. That is what we will be doing next time we go. The food on all of our flights was ok, I'm not a lover of plane food anyway but with Emirates it was nothing to rave about, what I did like was that the cutlery they gave us was proper silverware, makes a change from the flimsy plastic things that other airlines provide. One thing I think they definitely could improve on is the frequency of coming round the cabin with water. I know they have a lot of other things to do throughout the duration of a flight, however given how much they train their crew to stay hydrated, you'd think they'd want their passengers to stay hydrated too! It wasn't a problem to walk to the back of the plane and ask for a drink of water, however it is a bit awkward walking into the middle of the crew having their dinner to ask for it. The Emirates entertainment section (ICE) is impressive to say the least! It features new movies, classic movies, Disney movies, reality shows, documentaries, games and many, many other genres. It was a great source of entertainment for the kids travelling in our party, they just plugged in and that was them. Emirates provide each passenger with headphones, a blanket and a pillow so you can snuggle up and watch a classic to pass a few hours. The crew were particularly good with the kids, they were given an Emirates back pack with a load of cool things to keep them entertained. Their meals were brought out first which means mum and dad can have their food in peace! The stewardesses even came round with a polaroid camera to ask the parents if they wanted a photo with their kids. I thought that was a cute touch. Nice one Emirates! Overall, I'd say the flights were ok. Next time we make the journey though, I think we'll try another airline, to see how they compare to Emirates. I've written some handy tips for you below, just to make your journey a bit more comfortable. If you are like me and are on the curvier side, you may need a seatbelt extender. I know from experience how embarrassing it can be having to ask for one when everyone is seated, before take off. There seems to be three types of reactions from other passengers when this happens; you get the ones who couldn't care less and barely pay attention, you get the ones who try to give you the 'side stare' but try not to make it overly obvious and then you get the ones who blatantly stare at you like you are a monkey in the zoo, with that look of utter distaste on their faces. If I were a monkey in a zoo, those are the people I'd probably fling my poo at, but you can't do that on a plane, so instead what I do is stare at them until it makes them so uncomfortable they look away. Job done. I know I am heavy, I don't need some rude stranger making me feel even more uncomfortable than I already do when having to ask for a bigger seatbelt, thank you very much! If anyone reading this is one of those people, take a minute to think how that person feels -do you think it's easy or comfortable for them to have to ask for a seatbelt extender? My advice in that situation would be to take your own extender. You can get airline approved ones on Amazon for around £10. That's what we did. Saves any embarrassing encounters and is a bit more dignified than proclaiming to the whole plane that you need a bigger seatbelt. 2. Water - drink, drink, drink and then drink some more! When we arrived home from Australia, I felt horrible. At first I thought it was just the jet lag, but I felt nauseous, had stomach cramps and the worst dizziness. After making a trip to see my GP, I found out I was extremely dehydrated. I had no idea how, because I drank so much water on holiday that I actually came home weighing less! However, I refer back to my point above about being provided with water on the flight, all I drank on the flight home was water, I body swerved all fizzy items because I was so conscious of making sure I was having enough water. There were a few times on the plane though, where my mouth felt like cotton wool, because I was so dry, so I'd have to ask for more. They did bring round trays of drinks, but it was orange juice and pineapple juice etc - I don't know about you, but those types of drinks tend to make me even more thirsty! So my advice is to drink water continuously and when you think you have had enough, drink more. 3. Plan well and look for the flash sales. Flying upwards of 20 hours at one time is taxing on anyone, regardless of how frequently you fly. Passing through all those different time zones, plus the regurgitated air on a plane and the lack of a proper rest can really take a toll on your body. If you have the time (and the affordability) I'd definitely recommend booking an overnight at one of your layovers, for us it would have been Dubai or Singapore - you could even factor a few days in each place into your trip, giving you a chance to explore another country! I hope you enjoyed this post, I've been as honest as I can be in the hope that it makes someone else's trip more comfortable. Regardless of how much of a sale price you get your flights for, it's still an awful lot of money and you want to enjoy it as much as you possibly can.